This set may be purchased in bulk for 15.00ea when a mixed style and or size minimum of 6 outfits is purchased. There are 2 outfits in size 4T left in this color/style. If interested in a bulk purchase of below wholesale clothes, please send an inquiry to support@dapperlads.com. This fashionable special occasion 5-piece shorts set is ideal for weddings - as a ring bearer suit or as part of the wedding party. It is classic in style but with updates to make it little-lad youthful. Maybe best of all, it is comfortable and wrinkle-free. 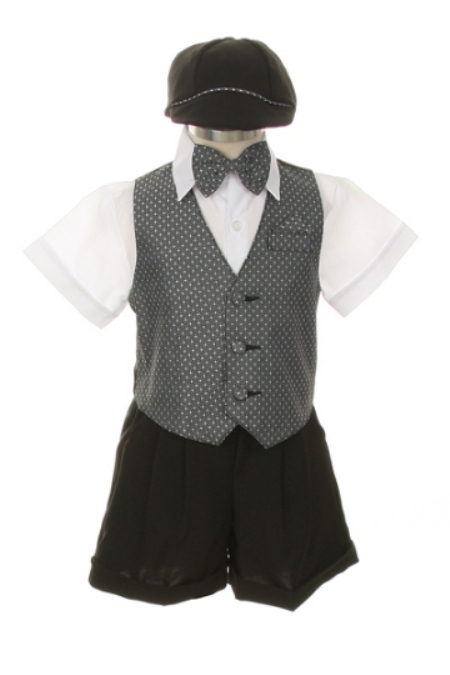 The set includes a fully lined dark gray patterned vest, a white short sleeve shirt, black shorts, clip-on bow tie and a matching cabbie hat. The vest and bow tie are a matte polyester with a microfiber look and feel. The shorts and hat are a good quality matte polyester. The shorts are cuffed with an elastic back and belt loops. They fall just above the knee approximately with a 3.5 inch inseam. From Shannon Kids USA. Machine washable cold, delicate. It does run slightly small.